When you create dependencies, i.e. establish logical relationships between planning elements, you draw up a project schedule. To do that, you need to edit the planning elements and add details such as start and end date, duration, the type of dependency and, if necessary, set restrictions. You can edit the planning elements in the planning list as well as in the Gantt-chart. 1. Move your mouse over the planning element until it turns into . 2. Now, click on the planning element and move the cursor to the other planning element to link them. 3. Let go of the cursor. The two planning elements are now linked. In the example below, the relationship is a so called Finish-to-Start Dependency: the activity “event marketing” is only to start after the milestone “kick-off meeting” is finished. That means, you have created a Predecessor (kick-off meeting) and a Successor (event marketing). To edit an existing dependency, double-click on the link between two planning elements in the Gantt-chart. The window Edit Dependency opens and you can now change the type of dependency. 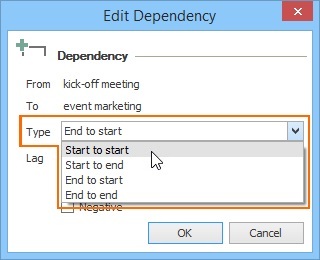 Click on the field Type to select another type of dependency. There are four different types of dependencies to link planning elements. This type of dependency establishes a relationship between the end of the predecessor and the start of the successor. You ensure that the successor can only start upon completion of the predecessor. Example: The activity “event marketing” can only start once the milestone “kick-off meeting“ has been successfully completed. This type of dependency restricts the start of the successor, as it can only start once the predecessor has started, too. Example: The successor activity “partner event program“ starts at the same time as the predecessor activity “customer event program“. That means that unless the predecessor has started, the successor cannot start. This type of dependency restricts the end of the successor, as it can only end when, and if, the predecessor has been successfully completed. Example: The predecessor “customer event program“ has to be completed at the latest on the end date of the successor “partner event program“, as the two programs have to be finalized for the creation of the event website. This type of dependency is only useful if you create a work-back project plan (work-back schedule). When you create a Start-to-Finish Dependency you link the start of the predecessor with the end of the successor. Example: If a company plans to shut down a server on a certain date and move their data to a new datacenter to consolidate the hosting, they need to make sure that the new server is up and running before they can shut down the old server. Therefore, the predecessor “full-time operation new server” needs to be completed before the successor “shut off old server” can happen. After having linked planning elements, you can set their start dates and duration. The end date of activities and summary activities is determined by when (date and time) they start and how long they take (duration). Milestones only have a start date – the date and time they happen. 1. To edit the planning element, double-click on it or click on it once and click on Edit in the ribbon. 2. In the side panel on the right you can now select the calendar, set the start date, and set the duration of the activity. HINWEIS InLoox has three default calendars to select from: 24/7 (continuous operation), Standard (Monday-Friday, 8 AM-4 PM) and Weekend (Saturday and Sunday, 24h). InLoox will automatically use the Standard calendar. 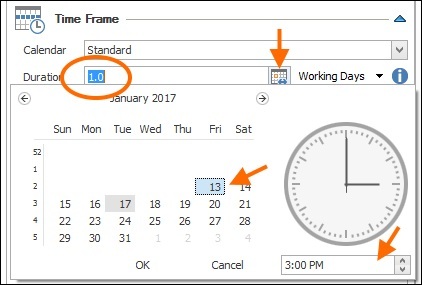 If you want to change the calendar settings, you can do that in the InLoox Options in the section Working Times. 3. Select e.g. 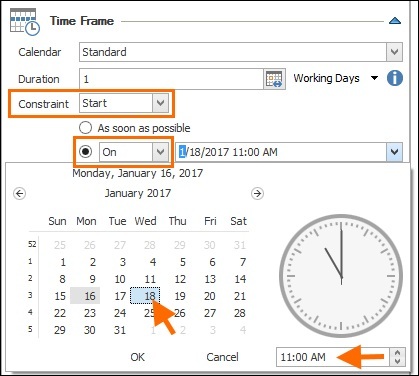 Start and set the start date by selecting On and choosing the date and time from the calendar. This way you establish a so-called constraint and set a time frame for the activity. 4. Now, set the duration of the activity by clicking on the calendar symbol next to the field Duration and selecting the end date and time of the activity. Thereby, InLoox automatically calculates the duration of the activity. Alternatively, you can also type in the work days manually. Instead of Work Days, you can also select Hours or Minutes as your preferred unit of duration. 5. You can display the duration of your planning elements in the planning list. 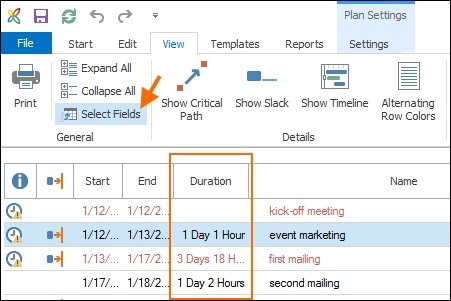 Click on Select Fields in the tab View, select the field Duration from the context menu and drag it into the planning list. It is advisable to zoom in and enlarge the view to show the individual days, so that you can work comfortably in the Gantt-chart. 1. Click on Zoom In or Zoom Out in the tab View to adjust the Gantt-chart to your needs. You can also use the short cuts Ctrl + Add (zoom in) or Ctrl + Subtract (zoom out). 2. Move your cursor over the activity until it turns into . Click on the beginning or end of the activity bar and expand or contract it. A small window above the activity bar shows you the name of the activity, as well as the starting date and end date, and the starting time and end time. 3. If you want to change the starting date/time or end date/time, without changing the duration of the activity, you can move the activity bar in the Gantt-chart. Click on the activity bar in the Gantt-chart and move it right or left to the desired date. 1.Click on the undo button in the Outlook tool bar in the upper left-hand corner . 1. Press Ctrl and click on the planning elements that are linked by dependencies, which you want to delete. 2. Then open the tab Edit and click on Remove Dependency in the section Action. Alternatively, use the shortcut Ctrl+Alt+D. 1. Move the mouse over the predecessor until the cursor turns into , click on the planning element and retrace the link with the mouse button held down. When you are hovering over the successor, let go of the mouse and the link is deleted. Dependencies between planning elements | InLoox 9 for Outlook • Copyright 1999-2019 © InLoox, Inc. All rights reserved.